Honey and soy mackerel Mackerel is a great fish for a quick and easy dinner. Cooked whole it stays juicy, even under a fierce grill. 1. Slash the fish 3 times on each side, cutting right down to the bone. Mix the soy, honey, stem ginger and lime juice. Rub all over the fish and well into the slashes. Lay on a foil-lined baking sheet and set aside for 20 minutes. Meanwhile, cook the rice according to pack instructions. Drain and mix with the vinegar, sugar and a good pinch of sea salt; set aside and keep warm. 2. Preheat the grill to its highest setting. Grill the fish for 5-6 minutes on each side. The skin will blister, so be ready to adjust the grill accordingly, but the fish should be a little blackened. 3. 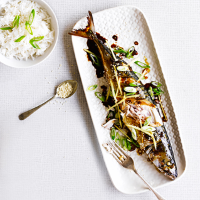 Serve the mackerel with the rice and sprinkle over the salad onions, root ginger and sesame seeds, if using. This recipe was first published in Fri Jan 22 09:50:28 GMT 2016.